Also seen in the Weekly Scrapper - go check it out here! 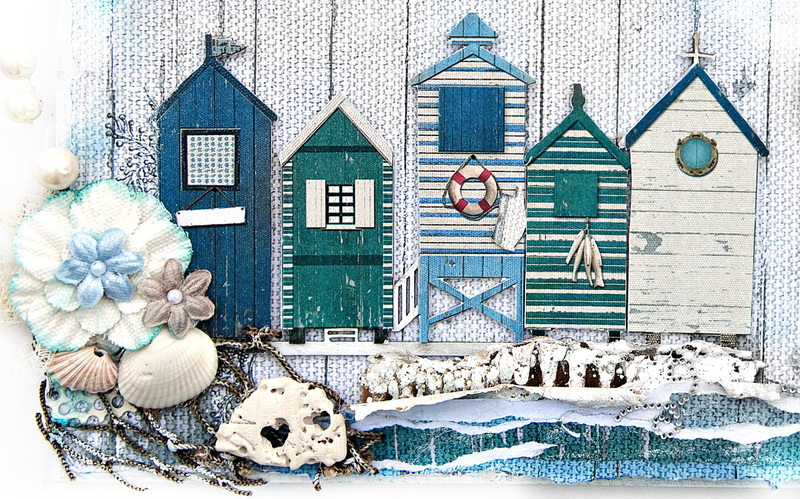 This is a wall hanging from FabScraps wonderful peaceful collection called Beachcomber. The collection can warm even the coldest days of winter. And trust that I sure do know cold living in New York. Recently we were having subzero cold with wind chill factors to freeze a hot cup of coffee into a coffee-pop in mere seconds. The wall plaque was purchased off the Christmas clearance rack at a store. I get chills when I see a 90% off clearance bin that I simply must dig through. I know I can paint and alter just about anything that a clearance bin has to offer. Happy digging. I really must remember to show you the plaques "before" I paint and alter. This one was exceptionally hideous - thus the banishment to the 90% clearance bin. I used to be ashamed to buy it and made up some lame excuse for the cashier. But I realized the cashier doesn't care and I must proudly take ownership. So I hold my head up high and happily dance off with my $1.99 special to store in my basement till it is called into action. I pulled out my Beachcomer collection, and accompanying chippies and was transported to a nice perfect beachy day, sunshine and all. The shells on this were actually from our last trip to the ocean which also warmed my heart. The image below shows a sample of the paper line as well as some of the die cuts. FabScraps has done something totally innovative in creating die cut paper pieces that match to cover accompanying chipboard pieces. OK - so what do I mean by the innovative die cut paper pieces matching chipboard? The beach houses below are all chipboard pieces. 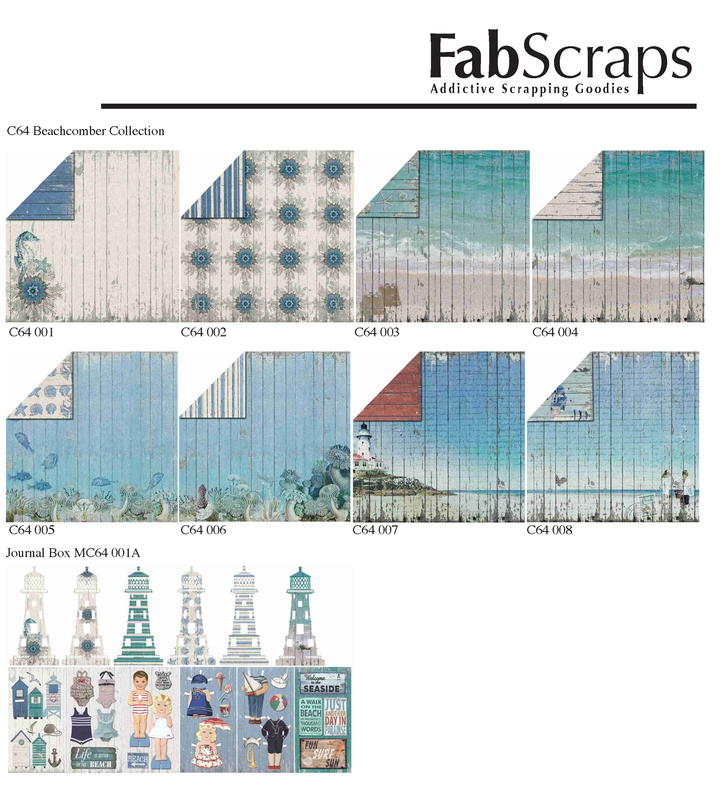 FabScraps printed die cuts that one can glue onto the chipboard for graphics if they prefer. I added my own sea serf and crashing waves with paper rips and cardboard that has been heat embossed. I added some touches of fishing net that I painted with gesso to soften a bit and blend. My seaside sign below was framed with jute and painted with gesso. Once again to give it a blended look. I had added simple instructions for this project below. Thanks for stopping for a look. Visit FabScraps blog and Facebook page for all the new releases. 2. Cut a piece of FabScraps Beachcomber Collection Big Belly Sea Horse 1 C64001 to fit a wall plaque. Distress edges then glue to plaque. 3. 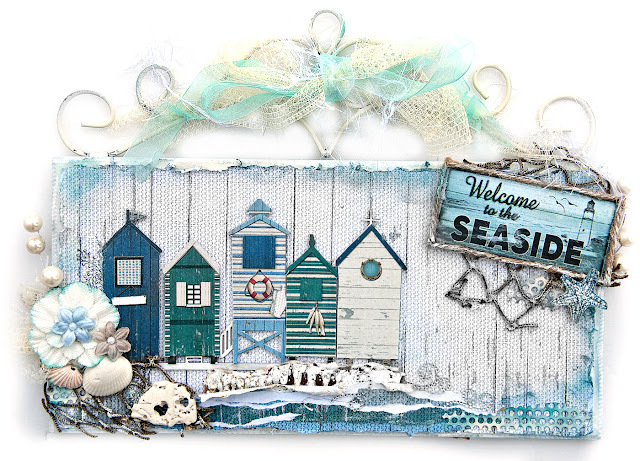 Cover FabScraps Beachcomber chipboard - Houses DC64009 with the matching die cut from MC64001A. 5. Ink the edges of the background paper with teal ink. 6. Cut two small pieces of fishing net. Glue on to the bottom left corner and one to the top left corner. Paint lightly with gesso for a worn seaside look. 8. Rip a piece of cardboard so that the corrugation shows. Paint it white and emboss with white embossing powder. And set with heat gun. 9. Glue beneath the chipboard buildings. 10. Rip a few narrow pieces of FabScraps Beachcomber Collection – Lighthouse 2 and Big Belly Sea Horse paper and glue over the cardboard. This should resemble crashing surf. 11. I added some dry wall tape to the layout here and there for more texture. I inked it with teal ink as well. 13. Add shells and flowers, netting and floral berries as desired. 14. 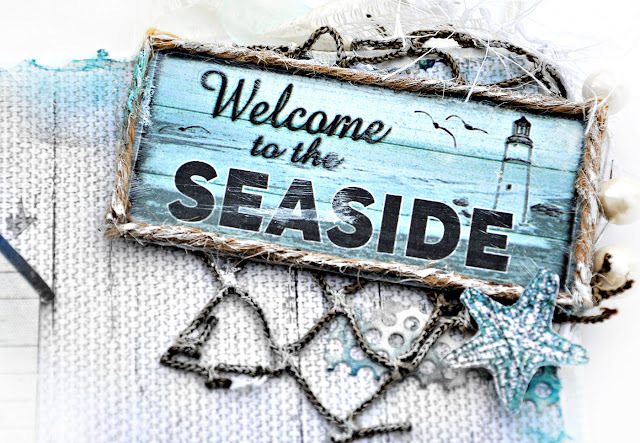 Create the sign by cutting the seaside sign from die cuts MC64001A. Glue twine to the edge. Lightly paint the twine with gesso. 15. Glue to the top over the fish net. 16. Embellish with starfish from FabScraps Beachcomber Collection – Big Belly Sea Horse paper. 18. Adorn the top of the plaque with netting and ribbons for hanging. Beautiful. Love all the details. Thanks for sharing this fabulous plaque.